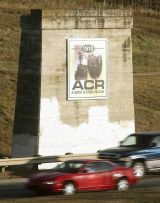 Taylor Drive traffic passes the new Alberta Central Railway sign on the concrete obelisk originally built as a railway bridge abutment. Signs marking the sole remnant of the best little railroad that never was were to be unveiled today. A chubby concrete obelisk that looks oddly out of place at its site alongside Taylor Drive, west of the Capri Centre, the bridge abutment is all that remains of a group of Red Deer and Ontario business owners' plans to build a Western Canada railway network. Backed by Red Deer MLA John T. Moore (Liberal), the Alberta Central Railway got its greatest boost in 1910, when Prime Minister Wilfrid Laurier and railways minister George Graham came to drive the first spike at site near the Capri, wrote Red Deer archivist Michael Dawe. But the plans fell short a year later when CPR took control of the ACR, promising to complete construction of the railway. Boosted by a federal subsidy of $6,400 per mile ($4,000 per kilometre), a railway station and yards had been built along with the first section of the line, running from Red Deer to Rocky Mountain House. But the CPR eventually abandoned the project and the line was ripped up, leaving only the two abutments where it bridged Waskasoo Creek. One of the two abutments was removed to make way for construction of Taylor Drive, wrote Dawe. Fearing that the remaining abutment would meet a similar fate, Red Deer historian Harlan Hulleman helped lobby the city to have it preserved. "I remember there being two, but when they built Taylor Drive, one was taken down. So, some people worry that this last bridge abutment might be thought of as too ugly to survive. "So, the idea of putting a mural on the abutment is so that people are aware of the significance of this railroad line and that we preserve it," Hulleman said on Thursday. He was among the people to attend the unveiling ceremony, set for 2 p.m. today. Pat Matheson, public art co-ordinator for the City of Red Deer, credited Hulleman with spearheading the creation and installation of the sign that now marks the abutment. "Hulleman raised funds for the project and approached the City of Red Deer for permission to have the sign placed on the abutment," Matheson said in a prepared statement. Local artist Shane Young designed the sign, featuring two historical photographs from the ACR: a steam locomotive and an image of Laurier and Graham driving the first spike. Sign sponsor Indie Signs transferred Young's image to a weather-resistant material and installed the sign on the side of the abutment.